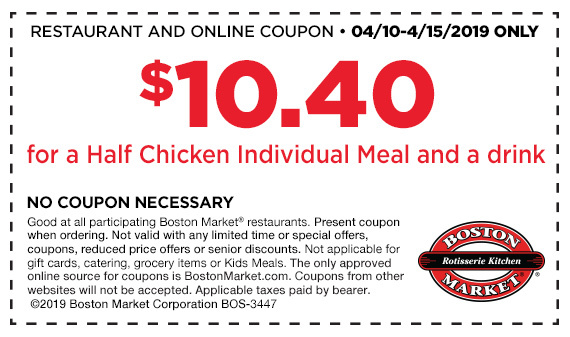 Boston Market is offering a Tax Day meal deal now through Monday. Use a coupon to get a half rotisserie chicken meal with drink for $10.40 at participating locations. Meals come with choice of two sides and cornbread. While you’re at it, sign up for the VIP Club and you’ll get a $3 off a $10 purchase coupon as a thank you. Go to BostonMarket.com for the deal. Connect with me: "Like" Doreen's Deals on Facebook; follow Doreen Christensen on Twitter, Facebook and sign up for my Freebie Friday Newsletter. Stream HBO for free and watch the long-awaited "Game of Thrones" Season 8 debut Sunday on Comcast Xfinity, DirecTV and Verizon Fios.